The Six Metre Band projects listed directly above are all located on this page. Some of these projects were built in the days before the internet arrived so I used whatever parts and construction methods I had at my disposal. I don't claim to be the original designer of any of these circuits. They have been taken from ham radio publications or found on the internet. I may have designed the PCB layout for my build but that is the only piece of originality. I built this receiving converter just recently (December of 2018). 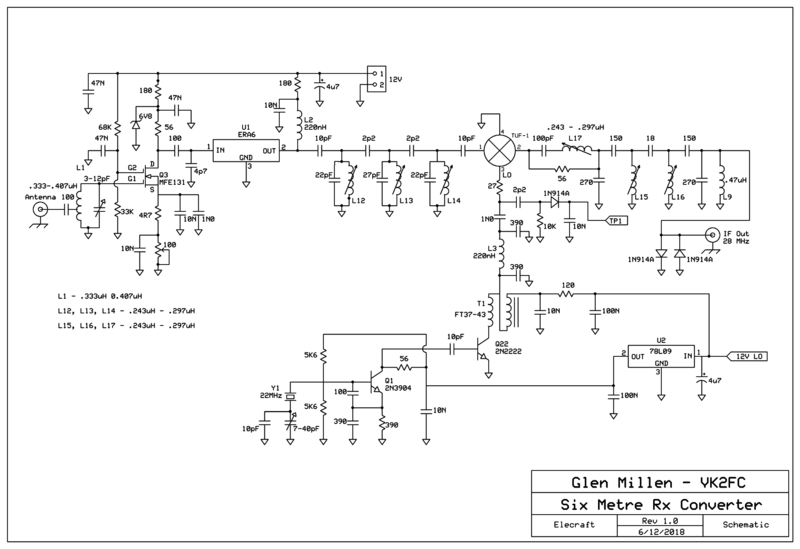 I found the circuit by doing a Google search which led me to the ON6MU web site. Actually I found many circuits but for some reason this one appealed to me. Again I made a PCB using Express PCB and the iron-on method. 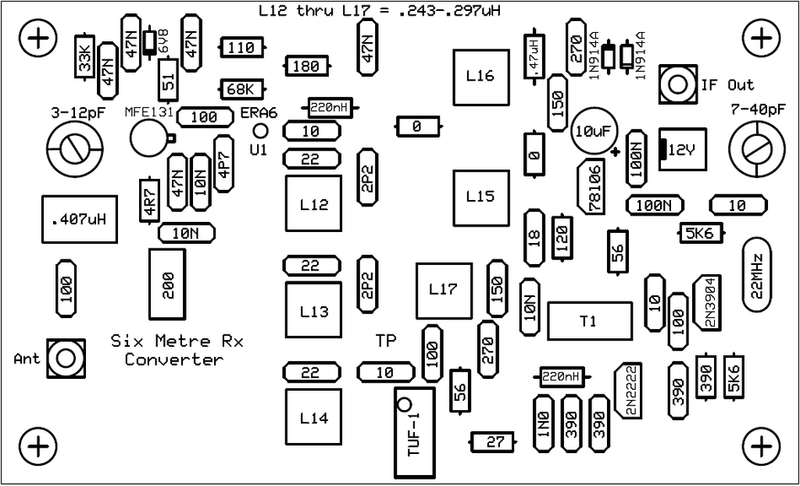 The 50MHz RF & mixer stage is an SA612 integrated circuit followed by a 2N3904 post mixer amplifier at 28 MHz. It's debatable as to whether the 2N3904 stage is required in my case but may be helpful if the receiver being used as the tunable I.F. does not have an R.F. amplifier at 28MHz. I have not enclosed my converter in a case as yet but I have tested it by listening to the local six metre beacon some 30 kilometres away. I can hear the beacon without an antenna! To suit my needs I did change some component values such as the output coupling capacitor. It is 10pF in my version whereas it was 270pF in the original. I found the lower value reduced the no signal noise floor in my receiver but did not reduce a signal's strength when one was present. The original source for this project and all of the info needed to build this converter can be found at the link below. 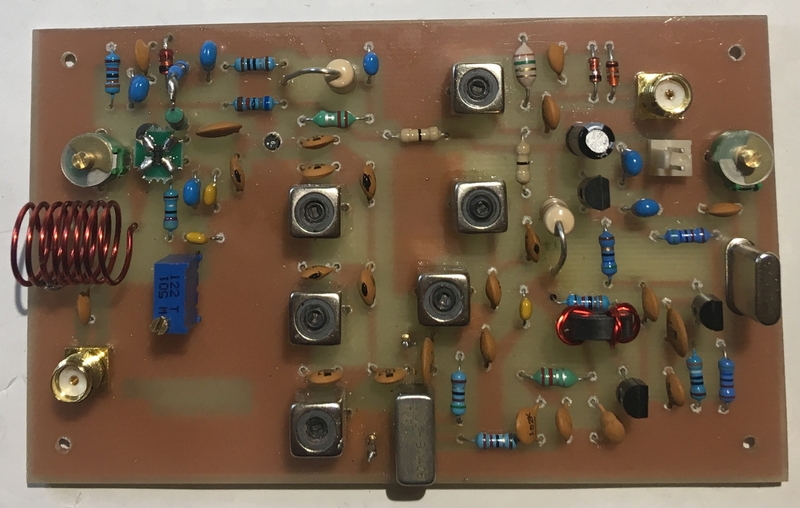 I built this converter in 1986 as an adjunct to the 3 Watt transmitting converter also featured in an ARRL Handbook of that era. The receive converter worked just as expected but I always had issues with the 3 Watt MRF476 P.A. stage of the transmitting converter 'blowing up' after a very short period of use. The other stages worked just fine. Back then I owned a Kenwood TS-430S HF transceiver which was being used as the tuneable I.F. Time passed and the TS-430S was sold and I ran out of ideas to resolve the multiple MRF476 failure issue. The MRF476 transistor became hard to get and or expensive so I have not pursued a resolution further. 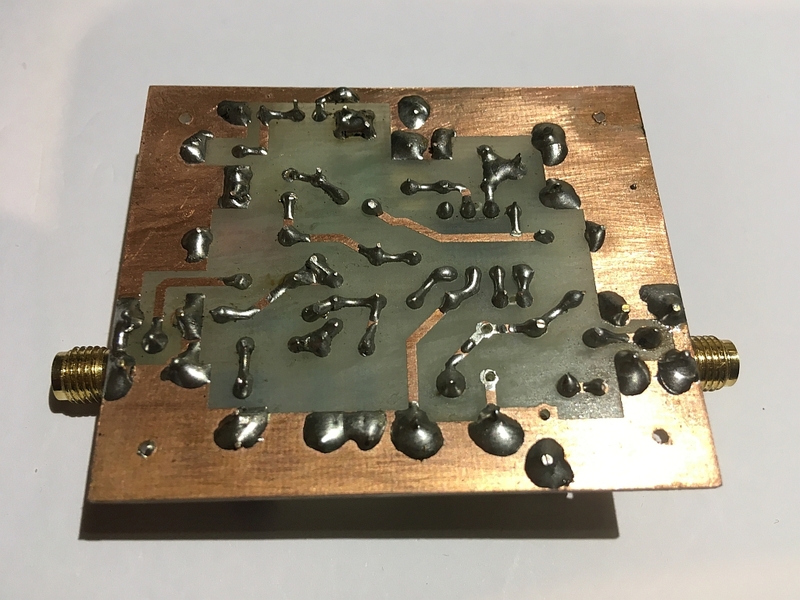 Fast forward to 2018 and I now have a few used MRF476 transistors which have been removed from commercial radios so one day I may get interested again in learning why they were failing. If I do find the reason, I may finish the complete transverter project! 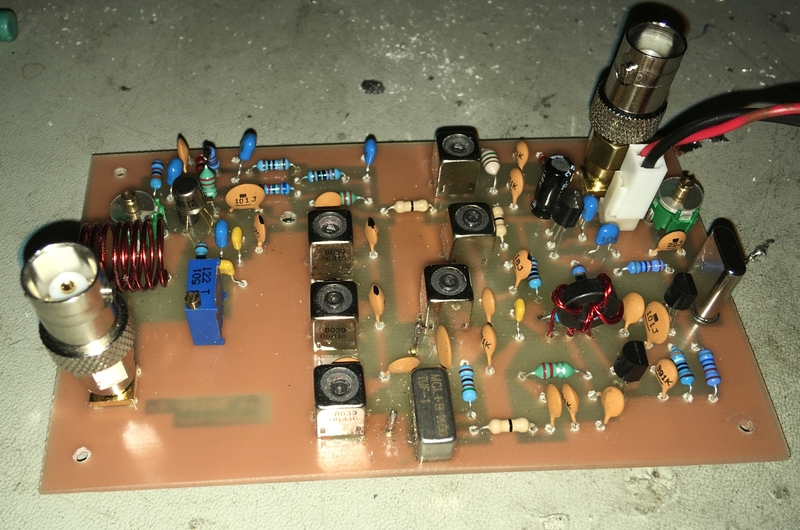 The PCB above is the 3 Watt linear amplifier for the ARRL transverter mentioned above. 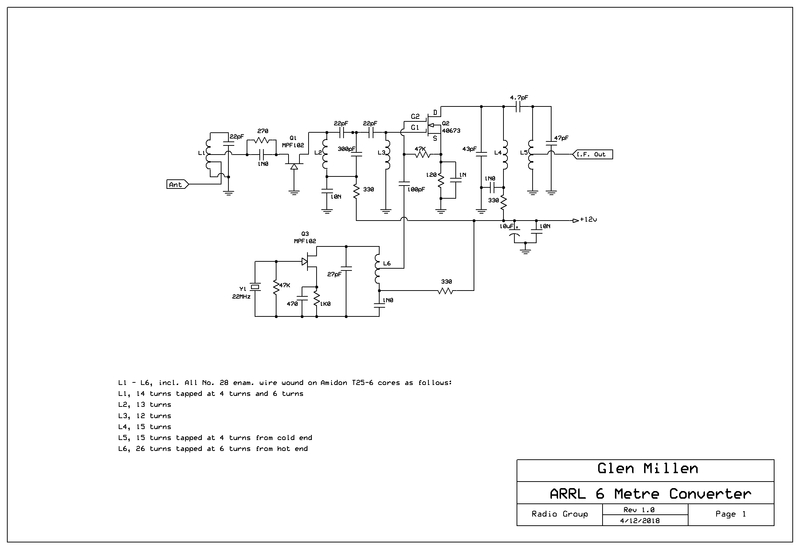 This circuit was also part of the same ARRL project. It's been sitting in my junk box since the 1980's. I have fitted another MRF476 transistor and have tested it in conjunction with the transmitting converter above. It produces 3 Watts just as described in the article. 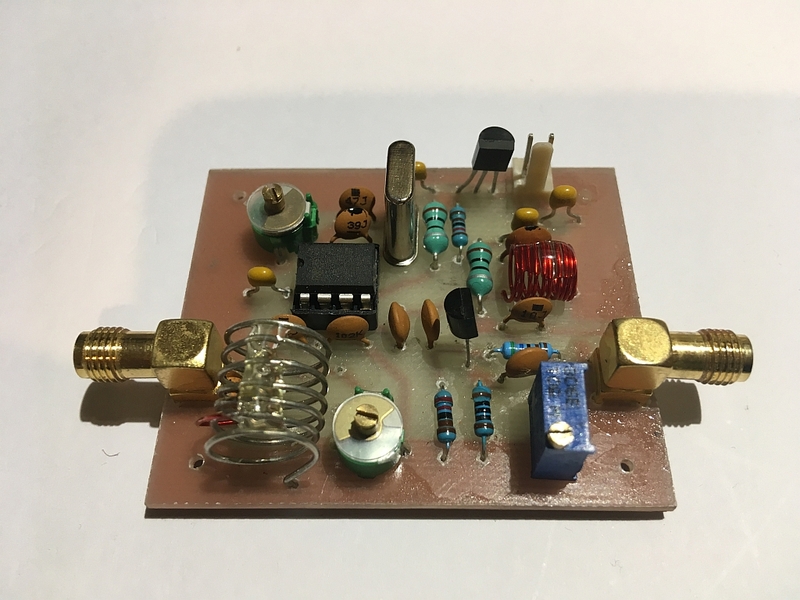 I plan to fit the receiving converter and this transmitting converter along with the 3 Watt PA stage into one cabinet to make a compact six metre transverter. Even though we had to endure a 40C plus heat wave over the last few weeks I got into the shed early and drilled some PCB including the one above before it got too hot. I spent all of Saturday assembling and testing and it works quite well with about 20db of conversion gain. I had to make some modifications on the fly during testing and debugging but no major changes. As expected, and due to the extra filtering, the unwanted signals at the 28MHz I.F. 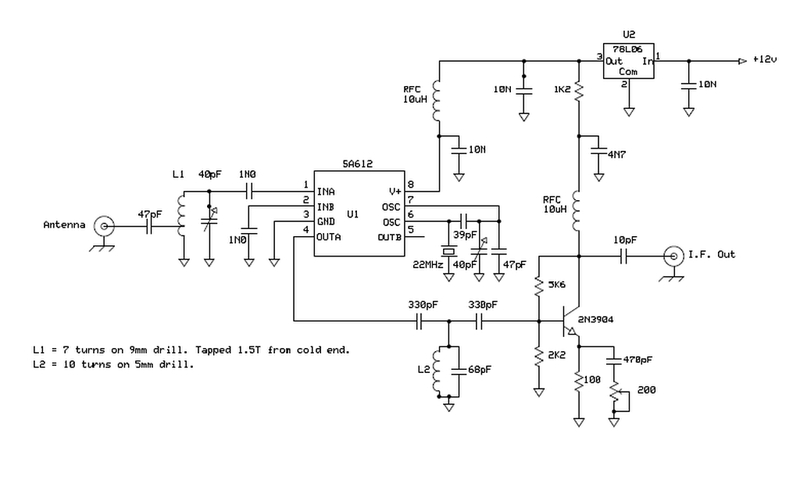 output are less than they are with the simple SA-612 converter described further up this page. The images below are of the ARRL 3 Watt transmitting converter featured in the 1989 ARRL Handbook. It has an output level of +16dBm. 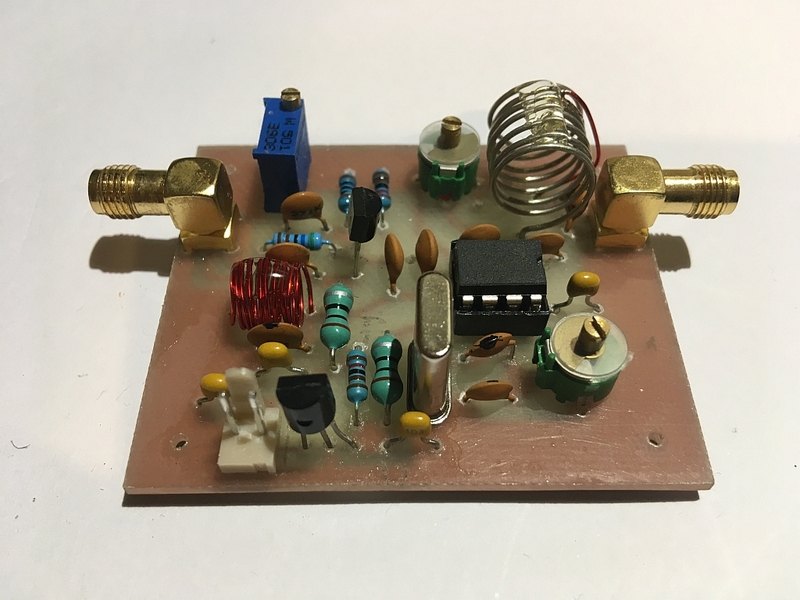 A 22MHz oscillator and a 28MHz signal from a transceiver is fed into an SBL-1 balanced mixer. The output is filtered and amplified in class A with 3 discrete transistor stages. The first a 2N5179 and followed by the bandpass filter then 2 x 2N5109 transistors.